One of my players suggested this book to me and I’m glad he did. I’ve read Ken Blanchard’s “One Minute Manager” and was very impressed with his writing, and this book was just as good. 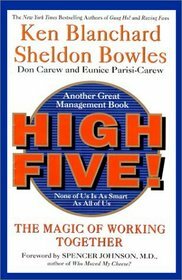 Co-authored with Sheldon Bowles, the book is a parable of a corporate worker who gets fired for not being a team player. In his spare time he takes up coaching his son’s fifth grade hockey team, and the lessons he learns about teamwork in the process. There were four main principles they listed to developing a “High Five” team spelled out the acronym P.U.C.K. Providing clear purpose and shared values. An over-arching team goal or purpose that everyone buys into has to be established before anything else. What is the “holy grail” that will challenge and motivate people to work together? Make sure there is a clear goal and strategy to achieve the goal. Once the team goal or purpose has been established then the individual goals and strategies need to be developed so each person knows how they can help the team achieve success. The shared values by a group helps to define the group and build shared team culture. The team purpose needs to be prominent for the group so they are reminded of where they are going (ie. the hockey team chanted their team purpose before every practice and every game). Unleashing and developing skills. The fundamentals needed to be successful have to become a priority. Without quality individual skills the team is useless. Each member of the team needs to have a solid working level of the skills it’s going to take to be successful in achieving the team purpose or goal. These skills need to be trained and developed until each has a working mastery of them. Feedback should be provided that is positive and builds confidence and accountability in each person. Creating team power. “None of us is as good as all of us.” The term they liked to use in the book was “synergistic harmony.” There must be a game plan that will help a team to be successful when each person plays their part. Establish a system of rewarding teamwork and making it more important than individual achievement. The individuals in the team have to understand the power and potential of what can be accomplished when they work together rather than working at the same time. Keeping the accent on the positive. The final step is to repeatedly reward and recognize the team when they are living out the first three steps. This will help build a culture in your team and keeps the cycle moving. For each step there needs to be repeated rewards and recognition so the team develops a habit of each one. This principle becomes the lasting piece that will help your team sustain success rather than going through highs and lows of working together as a team. The idea is to catch people doing the right things, and reward them or recognize them in those moments. Don’t punish negative behavior, but redirect the individuals towards their goals and the team purpose. All of the recognition and rewards should be linked to the team purpose and goals. The book was written for corporate management and team building, but the principles are the same for soccer teams. I really enjoyed this book, and I’m glad to see a university professor that makes his college students read books like this one. There is a lot of value to be reaped from this book and I would recommend it to anyone who works in a team environment. The fact that it is written in a parable format made the reading enjoyable and easy, but I would recommend spending some time and picking out the principles and digesting them a little. It’s easy to see how the four principles above can be applied to a soccer team, but the work comes with implementation. Most coaches will enjoy this book because it doesn’t try to rewrite anything or give us a magic formula. The principles in the book are all familiar, and sometimes we just need a reminder. But the four principles are logically laid out and I like how the authors show the progression; needing a team purpose before we can develop the skills to be successful individuals and help the team to that goal, etc. I think this will be a book that I will have to add to my collection and use as a resource for my coaching staff.